British Environment secretary Michael Gove has been photographed entering Downing Street with a reusable cup. Campaign groups welcomed the mug’s appearance after having sent the minister a bamboo reusable cup as a gift for Christmas. The minister, who expressed his concerns about plastic waste after watching the BBC’s Blue Planet series, had previously been pictured on numerous occasions with throw-away cups from a nearby coffee shop. In a letter accompanying their gift, RethinkPlastic! 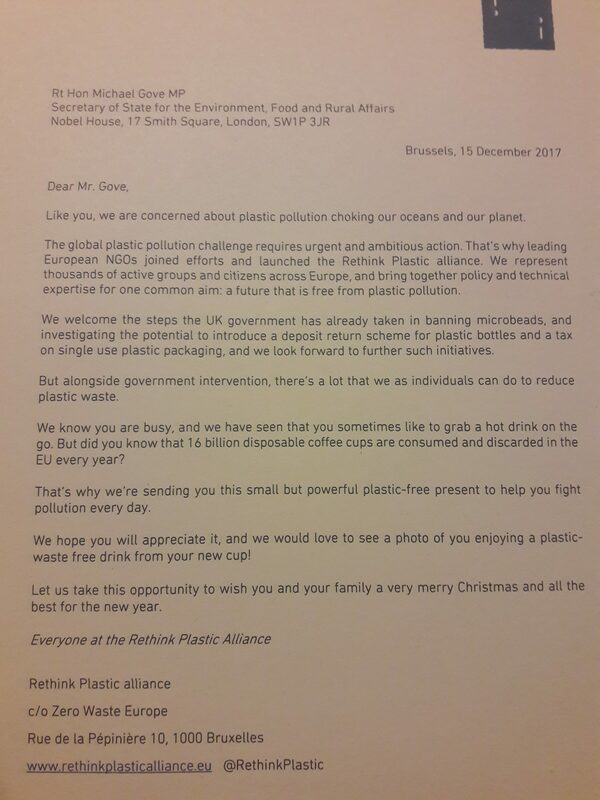 wrote that 16 billion disposable coffee cups are consumed and discarded in the EU each year and reminded Mr Gove that alongside important government policies there is much that individuals can do to tackle plastic pollution. British law makers have called for the introduction of a 25p (0.28€) ‘latte levy’ on all drinks sold in throw-away cups and campaigners have launched a petition to support the idea. At the end of last year the EU agreed to boost recycling and cut waste, central elements of its aim to move Europe towards a ‘circular economy’ where resources are reused of recycled rather than being thrown away.